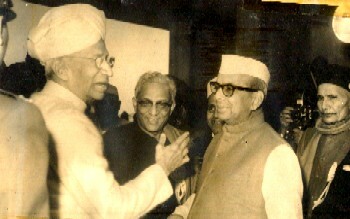 Govinddasji remained an active congressman and an active parliamentarian throughout his life. He was member of the Congress Working Committee and was a member of a number of delegations and committees of the parliament. He contested and won all the Loksabha elections from Jabalpur till he was alive. Govinddas ji was one of the leaders from Jabalpur who interacted and associated with the top leaders of his time including Gandhiji, Pandit Nehru, Dr Radhakrishnan, Moulana Azad, Dr Zakir Hussain, Morarji Desai, Indira Gandhi, etc. Govinddas ji was also fecilitated by several bodies and organization for his service to the country, to the parliament, to the Hindi Language and to art and literature. He interacted with all the leading writers and philosophers of the time including poets like Maithilisharan Gupta, Harivanshrai Bachchan, Dinkar ji, Mahadevi Verma, etc and Swami Akhandanand Saraswati, Maharshi Rajneesh and Mahesh Yogi. He was instrumental in bringing most of them to the city of Jabalpur. In spite being an active member of the Indian parliament he continued writing. List of his works, including plays, novels, travelogues, etc, both in Hindi and English language is given in the section Books and Literature. A freedom fighter, a politician, a writer, he lived up to the expectation of his people. In every way, he had fought for the nation. Through his writing, he has contributed to the Hindi literatures immortal compositions, which in time will remind the people associated with the literary field about the treasure left behind. Seth Govinddas ji passed away on June 18, 1974 and was cremated at the family funeral ground at Gopalbagh, Jabalpur amongst a huge crowd and state salute.